Uncle Rubberknee's Head of Class was handed out to the top team in November at Farside, celebrating a full year of Trivia Club at the Friendly Neighborhood 'side o' the street! Though two teams had built a healthy lead on the competition for the Grand Championship and two more teams weren't far behind, we still filled Farside with a full slate of competition, so it was truly anyone's night for this Grand Championship Finale! Trivia Classic ended with the Cunning Stunts off to a good start against the field, and with an initial advantage on the M. Night Shaym-Aliens in the overall race! Just three and a half points behind however, looking to make it a tricky night were 2 Guys 1 Trivia 1 Girl! A point behind them and no doubt keeping the Stunts on their toes were half of a now familiar team at Farside, former Golden VHS champs, featuring members of SPARTACUS, it was Biscuits! In fourth place were a mustachioed team that looked very much like The DDTs from two weeks ago, but it couldn't possibly be them could it? They had moustaches! Also from two weeks ago were Rooster Juice Mk. II, tied with Denzel's Vietnamese Sandwiches our wonderful team of familiar friends from The Rec Room! In seventh place, and point and a half back from those two teams and thus fourteen and a half away from the Cunning Stunts, were the M. Night Shaym-Aliens! This meant that though they left after night one, they now were behind early on leg two and shorthanded at that with Shelby and Joel holding down the fort! Rounding out the field, eleven points behind Biscuits in eighth were & Gravy! They were followed by OQB (Ol' Quizzy Bastards), and former Golden VHS Champs and crowd favourites Brewers Yeast Infection! Game Show Games began with Box Office Bullseye, and with that game Rooster Juice, The DDTs (with moustaches), and Denzel's Vietnamese Sandwiches won five points, while OQB, and Biscuits grabbed two points each as well! Then in Survey Says, The DDTs rode the power of those moustaches to a TOP TEN! This saw The DDTs in second place for Countdown Takedown, which saw them grab four points, but it was in fact the OQB (yeah, you know them) who nabbed the TOP TEN! With 2 Dudes 1 Trivia 1 Girl also picking up eight points, this produced a very tightly competitive field for our third round! Tri-Pardo then produced even more potential for points, as the first question was rolled by the Cunning Stunts for fifteen points, while Brewer’s Yeast Infection put another fifteen points on the line for the second question, and finally the third question was rolled for TWENTY by 2 Dudes 1 Trivia 1 Girl! Yes, fifty points were on the line for the third round on this night! Still, it wasn’t an easy fifty to grab, as some saw their fifteen from the first question or the second question cancelled out by lost points on the other question… while others either answered one of those questions correctly, but lost points on the third question as well! The Cunning Stunts, Biscuits, & Gravy were the only teams to not only keep from breaking even or losing points in the third round, but also gain twenty points! This left the Cunning Stunts with the lead on the field heading into the Trivia Finale , but with only a slim two and a half point on Biscuits! Still, in looking at their competition on this night they also had to remember they had a sizable lead on the M. Night Shaym-Aliens! With the Shaym-Aliens losing fifteen points in round three, the Cunning Stunts didn’t have to wager to win the Grand Championship, but they would still have to wager to win the Golden VHS, especially with Biscuits going all in! 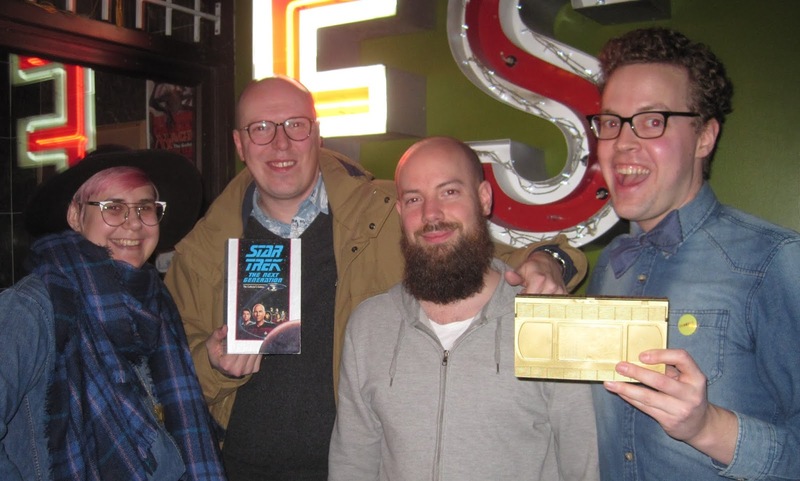 Pride won out it seemed, as the Cunning Stunts went all in on the blind wager, not wanting to join Not Turner at The Rec Room Roundhouse as the only teams to win a Grand Championship without winning a Golden VHS in the process! It proved a difficult Trivia Finale however, and like any night, it came down to getting that answer correct. Only two teams would on Wednesday the 21st, for the 21st edition of Trivia Club at Farside. The runners-up on the night, Rooster Juice mk. II would get the correct answer, as would our GOLDEN VHS CHAMPS… now TWO-TIME CHAMPS at Farside… BISCUITS, who finished the night with 138 points! This meant that finishing the night in fifth place with 10 points, but finishing November with 174 points, were the inaugural UNCLE RUBBERKNEE’S HEAD OF CLASS , and holders of the Golden Skull… THE M. NIGHT SHAYM-ALIENS! Even short handed, the lucky of the M. Night Shaym-Ali-Ace shone through! Dylan would even join in for the celebration afterwards! The Shaym-Aliens now join the Electric Mayhem, The Bastards, and Cunning Stunts in winning two or more Grand Championships, with Mat and Pat being the only participants who have won more then two! Runners-up for our first anniversary celebration at Farside, certainly helping to ring in the first year were long-time Wednesday regulars, the Cunning Stunts with their 157 points from two weeks prior being more then enough overall! This is also the fourth time that the Cunning Stunts have finished as runners-up in an annual event. 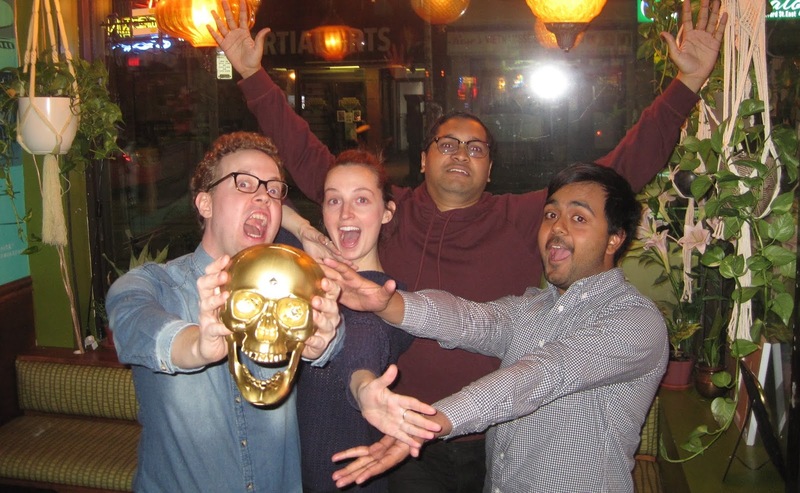 Speaking of one night of excellent trivia, Biscuits finished third in the chase for the Golden Skull! Thank you as well to Brewers Yeast Infection, Galaxy/Vietnamese Sandwiches, Rooster Juice, and The DDTs for competing all November long in celebration of Farside! Click here for more photo's of November's Grand Champs on Facebook! Join us again on December 5th in TWO WEEKS for the penultimate Trivia Club of 2018 at Farside, before the final Trivia Club of 2018 on December 19th in FOUR WEEKS at Farside!